Jason P. Capizzi serves as Bond Counsel to the Township of Weehawken. The Township successfully issued $8,752,000 Notes consisting of a $1,752,000 Bond Anticipation Note and a $7,000,000 Tax Anticipation Note of 2018-2019 dated August 30, 2018 to Amboy Bank. The Notes bears interest at the rate of 2.10% per annum payable at maturity. The BAN matures on August 30, 2019 and the TAN matures on June 26, 2019. Three Winne Banta partners have been included on the list of 2019 Best Lawyers. 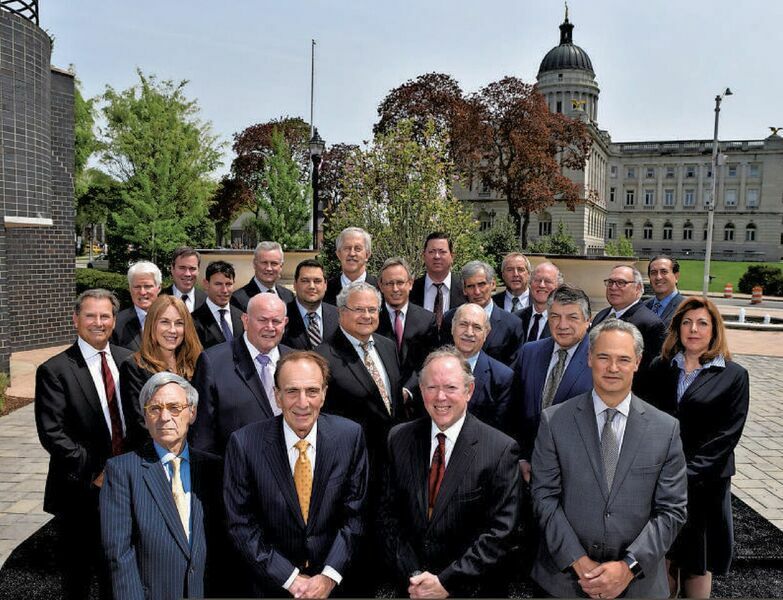 Joseph Basralian and Richard Kahn are included on the list of Best Lawyers in Real Estate Law. Kenneth Lehn has been included on the list of Best Lawyers in Commercial Litigation, Litigation – Labor and Employment and Litigation – Real Estate. Jason P. Capizzi serves as Bond Counsel to The North Hudson Sewerage Authority. On August 17, 2018, the Authority successfully defeased with cash all or a portion of its outstanding Gross Revenue Senior Lien Lease Certificates, Series 2012 A (Tax Exempt) dated May 24, 2012 in the aggregate principal amount of $8,000,000 (the “2012 Certificates”) and of its outstanding Gross Revenue Senior Lien Lease Certificates, Series 2012 A (Tax Exempt) authenticated August 12, 2016 in the aggregate principal amount of $10,825,000 (the “2016 Certificates”). The Authority also successfully issued Gross Revenue Senior Lien Lease Certificates, Series 2012 A (Tax Exempt) authenticated August 17, 2018 in the aggregate principal amount of $115,150,000 for the nondefeased portions of the 2012 Certificates and the 2016 Certificates. Bruce Rosenberg has been appointed by the City of Hackensack to serve on the Trustee Board of the new Hackensack Performing Arts Center (HACPAC). The new, state-of-the art facility, built in a former Masonic Temple, is home to professional theater companies and other arts organizations. Our friend and colleague, Matthew Cohen, a member of our Tax, Trusts & Estates practice, passed away on July 23, 2018 after a long illness. We will miss Matthew, and extend our deepest sympathies to his family. Jason P. Capizzi serves as Bond Counsel to the Township of Weehawken. The Township successfully issued a $613,000 Emergency Note (Taxable) dated June 26, 2018 to Amboy Bank. The Note bears interest at the rate of 2.00% per annum payable at maturity on June 26, 2019. Jason P. Capizzi serves as Bond Counsel to the Township of Weehawken. The Township successfully issued a $371,000 Bond Anticipation Note, Series 2018 B-1A, a $6,537,000 Bond Anticipation Note, Series 2018 B-1B; a $1,425,000 Taxable Bond Anticipation Note, Series 2018 B-2; and a $3,000,000 Taxable Tax Anticipation Note, Series 2018 B-2 dated June 5, 2018 to the Hudson County Improvement Authority. The Series 2018 B-1A note bears interest at the rate of 3.00% per annum and the Series 2018 B-2 notes bear interest at the rate of 3.25% per annum, payable at maturity on June 4, 2019. The Series 2018 B-1B note bears interest at the rate of 3.25% per annum payable at maturity on October 31, 2019. 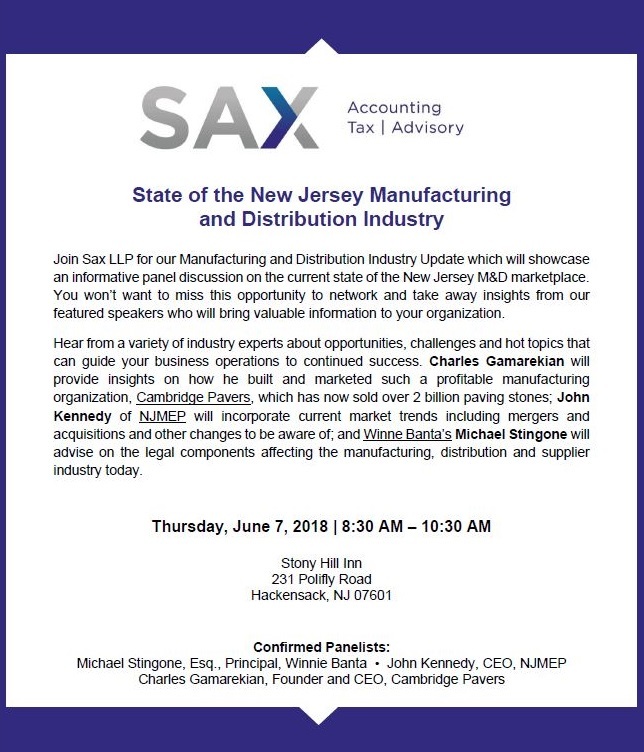 Sax LLP is presenting a Manufacturing and Distribution Industry Update on June 7 at the Stony Hill Inn. Winne Banta’s Michael Stingone will be a member of the panel, advising on the legal components affecting the manufacturing, distribution and supplier industry today. Jason P. Capizzi serves as Bond Counsel to the Borough of Tenafly. The Borough successfully issued a $2,876,013 Bond Anticipation Note dated May 31, 2018 to Jefferies LLC. The Note bears interest at the rate of 2.75% per annum payable at maturity on May 31, 2019.